Tyropita me Maratho means cheese pie with wild fennel. This is a traditional cheese pie, which my mother in law used to make with feta cheese and fennel. Marathopitakia are the smaller ones made into turnovers with a few extra ingredients. The Greek name for fennel is marathon (μάραθον) or marathos (μάραθος), and the place of the famous battle of Marathon (Μαραθώνας), literally means a plain with fennel. Fennel grew everywhere in their villages so one way to use it was to make pies. However, they used freshly made feta when making it, when it is still soft. During Easter when we went to Sparti we planned to make this tyropita. Near my sister in law’s house lives a family who have sheep and they make feta often. We wanted to buy some, however, we did not get lucky as they were not making feta during Easter. When we came back to Athens I kept thinking of this recipe but never found fennel at the farmers’ market. One day, a long time after Easter, I finally found some fennel at the farmers’ market. Although it grows everywhere in the countryside, you rarely see it in the farmers market. Coming back from the farmers’ market with lots of vegetables and herbs, I decided to make it. Instead of using fresh feta I decided to make it with fresh xinomyzithra, which some friends sent to us from Crete. However, you can still make it using regular feta mixed with anthotyro, which is similar to ricotta. If you use feta, be careful with the addition of salt as feta is salty. Now that it’s summer and very hot, it’s hard to stay at home, so I have been away during the weekend and we came back last evening. Today I made this amazing tyropita, which we ate as a main dish. To accompy it, I made this delicious Watermelon salad with grilled halloumi! 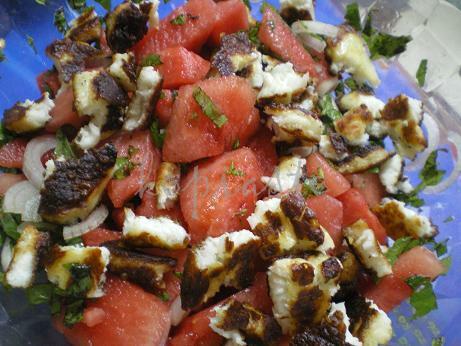 Halloumi as you know is a quite salty cheese and it pairs well with something sweet, so in Cyprus during the summer we always eat Watermelon with halloumi so I made this Watermelon Salad and ate it with the tyropita. The combination was heavenly, each bite was simultaneously sweet, salty, spicy, minty but mostly refreshing and delicious. After the Beef and Pork Galette, I decided to use the provencal pastry to make this cheese pie. A tyropita (cheese pie) made homemade phyllo, xinomyzithra and flavoured with wild fennel. Prepare the dough according to instructions. Only 2/3 of the recipe is necessary. Crumble myzithra cheese and grate graviera in a big bowl. Add the remaining filling ingredients and mix. Divide the dough into two pieces. One should be bigger than the other, as it will cover the sides of the baking tin. . Roll out two sheets of phyllo. Oil a 26 cm baking tin and place the biggest phyllo, covering the sides. Stretch with your hands if necessary. Put the cheese filling and spread it evenly. Cover with the second phyllo and cut whatever pieces are hanging out of the baking tin. With a sharp knife, lightly score the phyllo into pieces. I used 2/3 of the dough. If you want to use it all, to make a bigger pie, use a 28 - 30 cm baking tin. As I made the whole amount of the provecal pastry, there was some leftover dough and filling, so I made marathopitakia (small cheese and fennel pies). I added more herbs such as Swiss chard, which I boiled for 5 minutes and drained. Instead of Swiss Chard you may also use spinach. You can fry them if you like but I preferred to bake them. In Cyprus we would call these bourekia from the Turkish word borek and in Crete they are called kaltsounia, from the Italian Calzone. 2 cups xinomyzithra or feta, myzithra and graviera. Boil, drain, squeeze out all water and cut the Swiss chard into smaller pieces. Add all the other filling ingredients in a bowl and mix. Roll out sheets of phyllo and placing a small tea plate on top, as a guide, cut out circles of phyllo, about 12 cm / 7 inch diameter. Add a tablespoon of filling at the edge, brush edges with water and cover with the remaining half. Press with a fork to join the dough. Oil a baking tin and place the turnovers next to each other. Brush them with olive oil on top. Bake until golden brown, for about 20 – 30 minutes. That watermelon salad is very original and extremely appetizing! I bet it tastes wonderful! And your tyropita is just awesome! As lovely as the tyropita looks (and I do love tyropita, the watermelon looks even more delicious, given our hot weather, too. I love the idea of the combination of the watermelon and haloumi! Ok..I’m in love with the marathopitakia! And I also love the idea of the halloumi with watermelon…I love it all Ivy!…LOL. Enjoy the summer! Ivy, they all look so yumm! I haven’t had my bf today and I really wouldn’t mind digging into one of those! 🙂 Slurrrp! These look fab. Must put on the list. It would have been a fitting way to use a recent watermelon that wasn’t as stellar as I would liked on it’s own, as a salad it might have improved. Next time. Juicy melon salad ,such a tasty side with the cheesy Tyropita,yum! yasmeen’s last blog post..I love Cilantro! :Cilantro Coconut-milk pasta. Ivy, the karpouzi and the tyropitakia would be perfect to take to the beach. Have a mpanio for me! Oh, wow look at all this deliciousness! I love the watermelon salad with Halloumi, and both Tyropita and the Marathopitakias look soooo good!!! These sound great together with all the different sweet and savory flavors. My favorite kind of meal. Havent heard of this before, looks yummy, loved the watermelon salad! Love your cheese pies and watermelon with halloumi: very interesting. May I have some, please? The tyropita sounds quite flavorful and the salad sounds so very refreshing. Love watermelon with a salty cheese and halloumi I am sure goes excellently. Delicious looking tyropita, Ivy. That has always been (and will always be) one of my favorite things. I really want to try this provencal pastry. Hopefully soon. 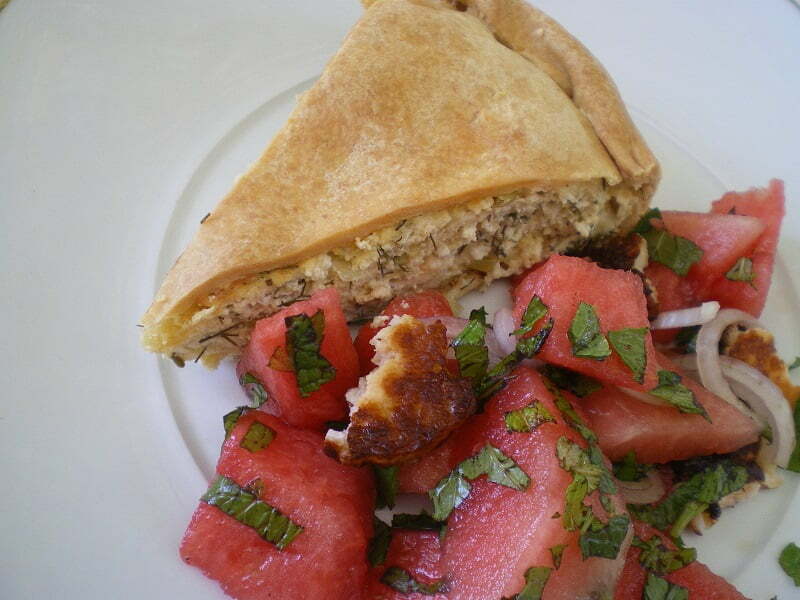 Your cheese pies look incredible, and I have to try the salad with watermelon and haloumi! That sounds so delicious. The pie looks good Ivy! ANd the salad is something else -very interesting flavours working there. We have yet to buy the first watermelon of the year. SI already told my husband I am missing it LOL! So I will make this recip … looks good! While I like the filling in this, the watermelon here just wins it for me. I love the mix of colors, and think it works great with the mint. Very summer influenced and cooling. The watermelon salad looks so fresh and perfect for warms summer days. Sylvia’s last blog post..Eat like a king …. Those cheese pies look really good. I like all of the fresh herbs in them. Salty fried halloumi would go really well with watermelon! I like to sprinkle some salt on my watermelon so I can imagine it would be great with a salty cheese! Looks yummy! Ivy this reminds me so much of my time in my Yiayia’s village in Cyprus. As I have been travelling I have not seen her in 6 weeks so it is nice to have such memories. Thank you. Thanks to you, I finally made a version of the watermelon salad today. Just for me. Watermelon, feta, basil, onion and a touch of balsamic vinegar. Oh my oh my! So delicious. I will search out some halloumi here in Ohio so I can try your recipe. It’s just perfect for our hot steamy summers. And I am eager to try your tyropita, too! Mmmm. Yummy tyropita with watermelon salad pictures.